I have no clue what Desert Golfing is. I installed this little game last year when I heard how ludicrous this minimalist app was. Being one who needs to witness these sorts of things for myself, I dived right in, and to this day, I have not resurfaced. This is not a puzzle game. It is not a brain teaser. It is barely even recognisable as golf. In it, you are an invisible force in a 2D desolate landscape with only sand and sky as your surroundings. The only objects you interact with are a single pristine white golf ball and the hole you must knock it into signified by a corresponding flag labeled with the number of the hole you are currently aiming to complete. One of the most abstract features of the game is that there is no par score. You can spend several minutes, hours even, using as many shots as it takes you to get the ball into the hole with zero penalty. One of the most interesting aspects of Desert Golfing is the fact that, as far as anyone can tell, it’s endless; however, unlike the fast-paced and frenetic endless runners we’re so used to nowadays on mobile games, here it is soothing. It’s reassuring knowing that you may have completely blundered through one hole, which took you seventeen shots to make right, but at least on the next hole you can hopefully sink it in one and make up for lost time. The courses themselves are strange as well. They’re an odd mix ranging from very austere and simple landscapes, to titanic hills and cavernous crevices that defy logic. I once even ran into a bottomless pit, and others have spotted water features such as ponds. I have not been so lucky, yet. While these courses may bewilder and elude you, they are still calmly laid out for you to take at your own pace. There’s no real fear or panic, just a relaxing game of golf (sort of). 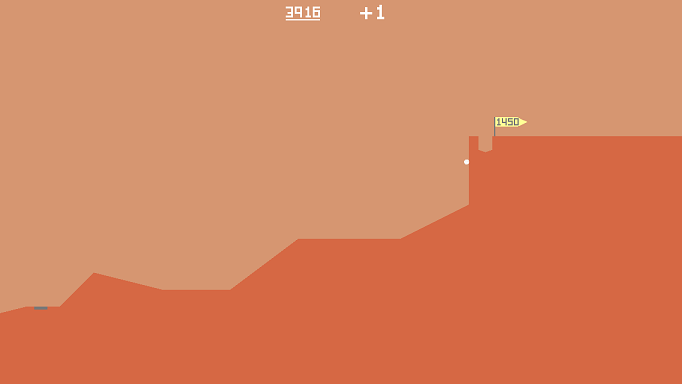 The true worth of Desert Golfing comes from the fleeting glimpses of different environments as they morph over time. The game’s description details how you will find “a heaven in a wild cactus.” I was at hole 316 and one stroke past one thousand into the game when I saw a cactus. I was ecstatic; however, that is but one spark of variety, as this element of the game combines with the endless nature of it. The game’s colour palette itself very subtly changes with each consecutive hole. Starting from a bright orange, I am now nearly at hole 1,500 and my game resembles more of a burnt sienna-blood orange red. I’ve seen a fifty-minute time lapse of the first 10,000 holes, and throughout it, the game bleeds into vivid reds, blinding neon pinks, melancholic blues, sickly greens, and fantastic yellows. I’m excited to witness all of those for myself. Desert Golfing is a beautiful minimalistic piece of art as well as a mobile game that will drive you up the wall with its physics and and the damning nature of golf itself. You may curse yourself for firing a shot too long or clutch at your temples because you are less than a hair’s width from landing a hole-in-one. Yet you will appreciate what Desert Golfing makes you realise: even a wasteland can be an oasis. This game sounds so bizarre. What a concept to actual put through creation. Like meditation through gaming.